The Mercedes cars were fast in Free Practice 3 for the Spanish Grand Prix. Really fast. In fact, Lewis Hamilton set a new, but unofficial lap record, and teammate Valtteri Bottas was just a tick slower. The line-up for the weekend was: Mercedes – Hamilton and Bottas; Ferrari – Sebastian Vettel and Kimi Raikkonen; Red Bull TAG Heuer – Daniel Ricciardo and Max Verstappen; Force India Mercedes – Sergio Perez and Esteban Ocon; Williams Mercedes –Lance Stroll and Sergey Sirotkin; McLaren Renault – Fernando Alonso and Stoffel Vandoorne; Renault – Nico Hulkenberg and Carlos Sainz; Toro Rosso Honda – Brendon Hartley and Pierre Gasly; Haas Ferrari – Romain Grosjean and Kevin Magnussen; Sauber Ferrari – Marcus Ericsson and Charles Leclerc. Hamilton was fastest on Friday, clocking a 1:18.259 on the soft compound Pirellis. “The day was pretty good,” he said after FP2, “but it was a tricky one because it was so windy out there. Every driver was struggling with the changing direction of the wind. You're constantly arriving at each corner and the wind direction is never the same, so we saw lots of drivers going off. Many drivers had problems getting the super soft tires to work properly on Friday, and some of them believed that the soft and medium compounds would be the best options for the race. The Sauber drivers were the first out in FP3. The ambient temperature at the start of the 60-minute session was 68 degrees Fahrenheit (20 degrees Centigrade) and the track temperature was 90 degrees Fahrenheit (32 degrees Centigrade). Only about half the drivers did an install lap in the first dozen minutes, and only Hartley completed any flying laps during that time. Then, at the 15-minute mark, Bottas got down to business and posted a 1:18.496 using the softs, only to have Vettel beat that with a 1:18.324 on the super softs. Hamilton, also on the softs, then turned a 1:18.112. The soft tire was working well on the Mercedes, and Bottas proved it by setting a 1:18.081 followed by a 1:17.873. That was a new unofficial track lap record. 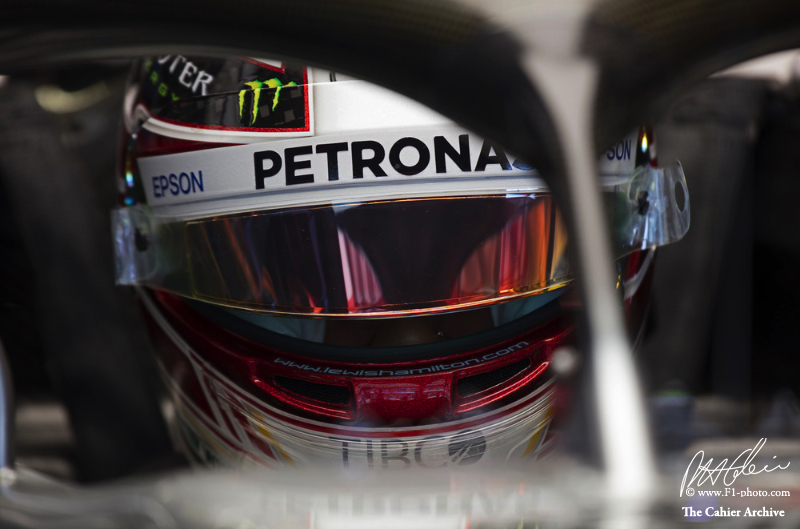 Hamilton then set a new one himself – 1:17.844. With just over half an hour remaining the top eight were: Hamilton, Bottas, Vettel, Raikkonen, Ricciardo, Grosjean, Verstappen and Alonso. They had used a variety of compounds to set their times. The Williams drivers found the car almost undrivable on Friday, and Stroll had another trip to the gravel trap, at Turn 4, on Saturday. This time he avoided the barriers. Meanwhile, Vettel got down to a 1:17.604 using the super soft Pirellis. With 20 minutes remaining, the Merc drivers switched to the super softs. Bottas turned a 1:17.431. Hamilton beat that with a 1:17.281. Meanwhile, Ricciardo had a spin at Turn 13 while running the medium compound tires. Raikkonen improved but stayed fourth behind Hamilton, Bottas and Vettel, who had also improved. Ricciardo and Alonso rounded out the top six with 15 minutes to go. Hamilton did a lap that started fast but ended with a mistake. Bottas cut his time down to 1:17.294. So the top six order remained unchanged with 10 minutes remaining. Grosjean, Magnussen, Hulkenberg and Verstappen rounded out the top 10 at this stage. But now Ricciardo was on a new set of super softs for his qualifying sim. He went faster but remained fifth. Teammate Verstappen was in the garage with an electrical problem. With just under two minutes remaining Hartley had a big shunt when he clipped the grass going into Turn 9. The session was red flagged as he climbed out of the wrecked car. The top 10 at the end of the record-breaking session were: Hamilton, Bottas, Vettel, Raikkonen, Ricciardo, Magnussen, Grosjean, Sainz, Alonso and Gasly.